Friday night will be the last chance for us to lace up our flats and do a little racing in 2013. In fact, it may be the last time we really try to “go fast” before Ironman Texas. Immediately after Friday night’s event the focus will shift to volume, volume and more volume. Long steady runs, long, cold, windy bike rides and early morning long swims in the pool. 80-120 laps long. But one more time this year we’ll push the limits at the Ronald McDonald House Lights of Love 5K. This is an annual event that the whole family has gotten involved with since our good friends the Smith’s here in Austin had their little boy Caleb a couple of years ago. Little Caleb had a ton of challenges when he was born. Most to do with his digestive system and ability to go potty. He struggles getting nutrition, going to the bathroom still even after numerous procedures and surgeries. He and his family traveled to Cincinnatti a little more than two years ago for the first time to consult with the best Doctors in the country for Caleb’s ailments and for his surgeries. The cost of flights, meals, time away from work and finding a place to stay became a huge struggle for our friends and as the stress of the situation became harder and harder to deal with – Ronald McDonald House stepped up to do what they do best. Provide a welcoming environment for the Family to stay together. A safe place to stay, do laundry, cook meals, play together and be a family. All for less than $20 a day. Truly amazing. Ronald McDonald House Charities has been doing this since it was founded in 1974. That year the first Ronald McDonald House opened its doors in Philadelphia, Pennsylvania. At the time Kim Hill, the daughter of Philadelphia Eagles football player Fred Hill, was undergoing treatment for leukemia. Throughout Kim’s treatment, her father recognized the need for a supportive environment away from the hospital for families of seriously ill children. He enlisted the aid of his teammates and local McDonald’s restaurant owners to raise funds that would help purchase and renovate the first Ronald McDonald House. The first Ronald McDonald House was named, not only because of McDonald’s fund-raising support but also for the positive, hopeful, and fun-loving feeling Ronald McDonald was able to instill into the minds of so many children. Today there are over 300 Ronald McDonald Houses located in 30 countries and regions world-wide. Growing up in suburban Philadelphia at the age of 7 in 1974 and having lost a sister to Leukemia the mission of the Ronald McDonald House has always had a special place for me and after seeing how much they helped our friends the Smith’s with their son Caleb’s needs we have tried to do all that we can to help. 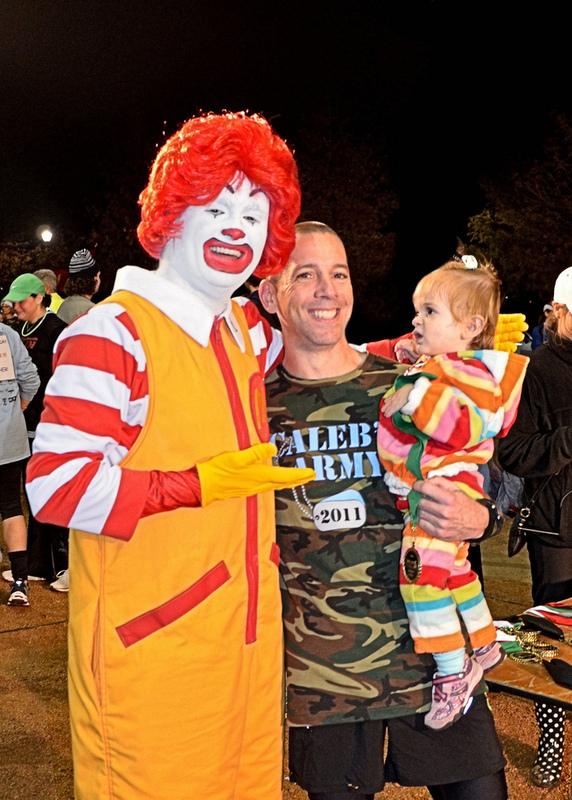 This year Landry is again raising money for Ronald McDonald House as part of Caleb’s Army. To help her out her Mother and Father have committed to match every donation that she secures dollar for dollar up to $1,000. Come Friday night we hope to be donating at least $2,000 to Caleb’s Army and then Dad is going to go out there and see if he can’t chase down one more PR this year. Fast or slow won’t really matter at the end of the day, this one is all about helping those less fortunate. Today is Giving Tuesday – so please make the most of it and visit Landry’s fundraising page located HERE and make your gift today – any amount will help her reach her goal and it will be doubled by Dawn and I. Thanks everyone! Hope to see you on Friday!